I love these typewriters, especially in this color! 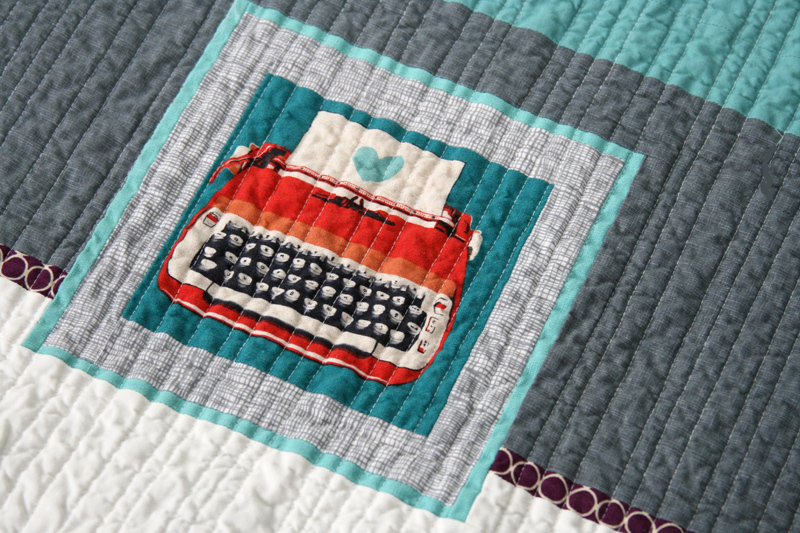 When Melody Miller’s Ruby Star Shining line first came out, I immediately wanted to use the typewriters in a quilt. I had a stack of solids sitting out – the aqua, dark eggplant, cream and red – with the intention of using the pairing for a quilt. I was so pleased to see how well they went with this typewriter print. I don’t usually draw out my quilt designs in advance, but I did for this one, and surprisingly enough, it ended up quite close to my original drawing (which can be seen in this post). I finished the top a while back, and as you know, it unfortunately ended up stranded in the closet. I’m really trying hard to work my way through those unfinished quilts so I pulled it out and made up a backing with the leftover fabrics. I love the backing almost as much as I love the front, so I’ll definitely be happy regardless of which side is up! I quilted it with straight lines of uneven widths. It was definitely not a quick finish! I started counting the lines, trying to determine approximately how many I had left (as if that might motivate me to get it finished). I don’t recall now exactly how many lines I actually ended up sewing – all I know is it was a lot! But I love the look and texture of those straight lines, so I think it was worth it. 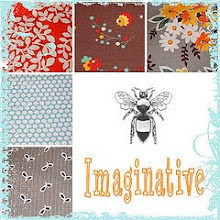 This entry was posted in [search] Strip Quilts, [search] Wonky/Improv Quilts, Posts about Quilts, Quilts and tagged handmade, improv quilt, melody miller, modern, quilt, quilting, ruby star shining, solids, straight line quilting, stripes, typewriters. Bookmark the permalink. That is stunning! A fantastic design, those colours are perfect for setting off the typewriters. Wow you’re really churning through those quilt tops now! You did such a good job piecing those typewriters in line but what really impresses me is the perseverance you repeatedly exhibit with your pinstripe quilting. lovely! soo soo pretty. i still need to get some of those typewriters. Your quilt is lovely, and the background is intriguing. Where did you take these pictures? 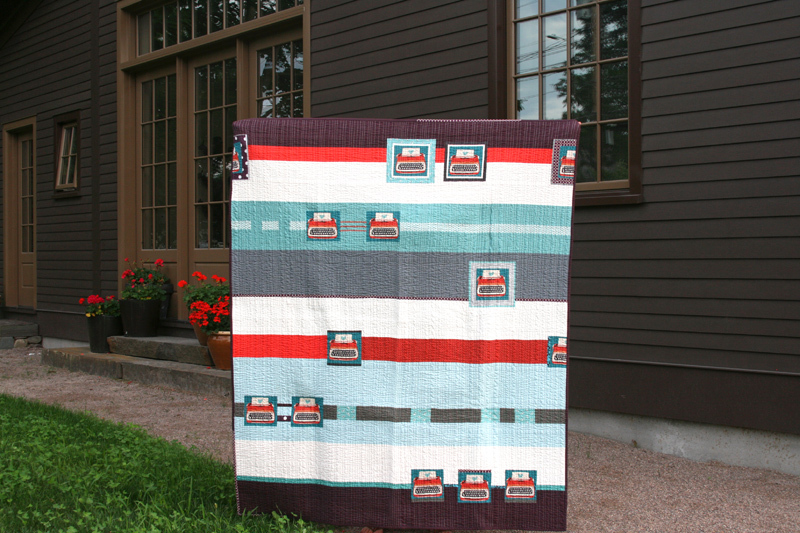 I am a newbie to quilting and to your blog, and this quilt especially inspires me! I have plans to make my second quilt for my great-nephew, and now can’t wait to get started. how to use it. You are always such an inspiration! Yes, me too! I have this fabric, but it’s heavier than typical quilting cotton. What a nice idea! This is just too perfect! Great colors-love it! Love the colors! Perfect with those cute typewriters. Yep, the quilting looks great! Glad you had a chance to finish this one. This is just so cool. 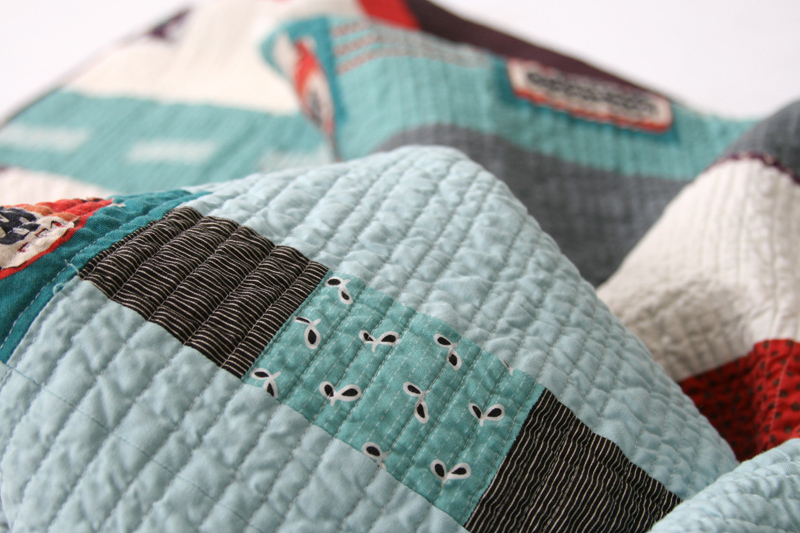 I am in love with the whole thing…the front, the back, and the quilting. What a great homage to typewriters! it looks so great… such a fun design to feature those typewriters! Very pretty! 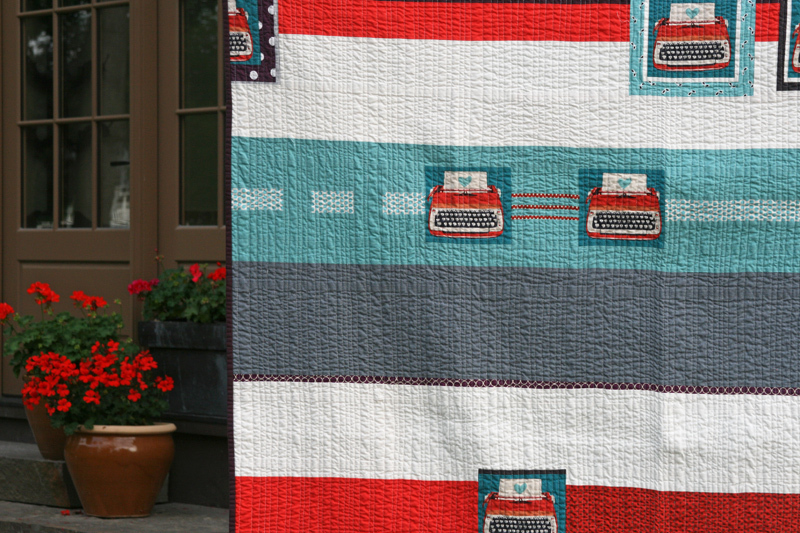 What a great set of fabrics and colors — so perfect for those typewriters. Love it! Looks great, I’ve seen these typewriters all over and you nailed it! You’re right – the back is equally as special as the front! YES! This is the one I wanted you to finish. Love it! What a gorgeous quilt. Those straight lines do take time to quilt but the finish is totally worth it IMO. 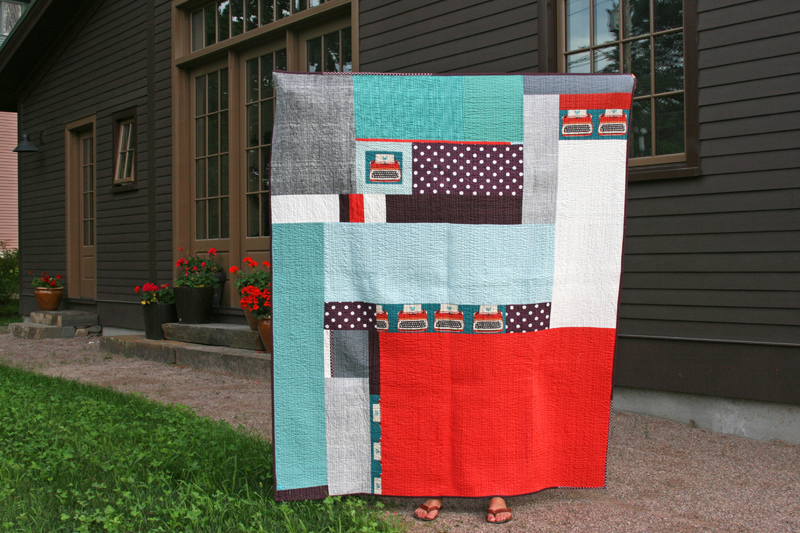 Oh my gosh… I just found your blog… and I LOVE that quilt! Love this quilt (both sides) and the quilting! I’m surprised at how much I love this quilt, since I’m not a purple/eggplant person, but this is just stunning. I love how you put colors together. You do it so well. I love the organic lines — always take forever, ALWAYS worth it. Beautiful. Wonderful quilt! It’s absolutely perfect: the design, the colors, the quilting. LOVE IT! Great quilt – love it! This quilt represents the very reason I LOVE Modern Quilts. It makes me happy and brings a smile to my face through all its whimsy and character. Who knew that silly ol’ typewriters could bring such feelings of JOY within a person! hahahahahhahaha Okay, I am forming a line to buy your pattern. May I please be first in line? 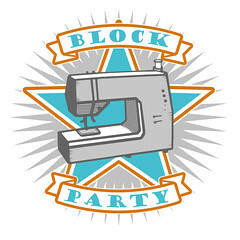 *smile* I’m going to bed tonight, dreaming of making this quilt!!! Genius! I love it! I can think of several “cubicles” that could benefit from this quilt. Adorable! 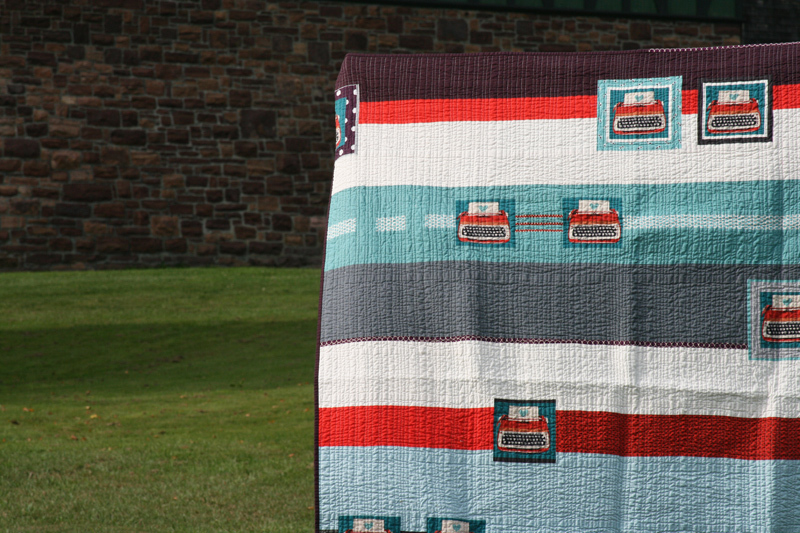 I may have to use this as inspiration for a “car” quilt for my grandson! And the scenery in your pix is so lush and gorrrr-jusss! Thanks for sharing your talent! Ohhhh man do I LOVE this quilt. I could copy it inch for inch. What a beautiful job. I agree, I like the back as much as the front. Don’t you love it when that happens. I’m a newbie quilter so I’m taking in every beautiful quilt I can and this one is very inspiring. To DAMN CUTE/./……I have seen people use this fabric other ways.. ahhhh, but this just fits all together.. Is this your Castle too, because I think that would inspire me to do a few things too….. This is really an adorable quilt! Great job! I love this ever so much. So, so much! 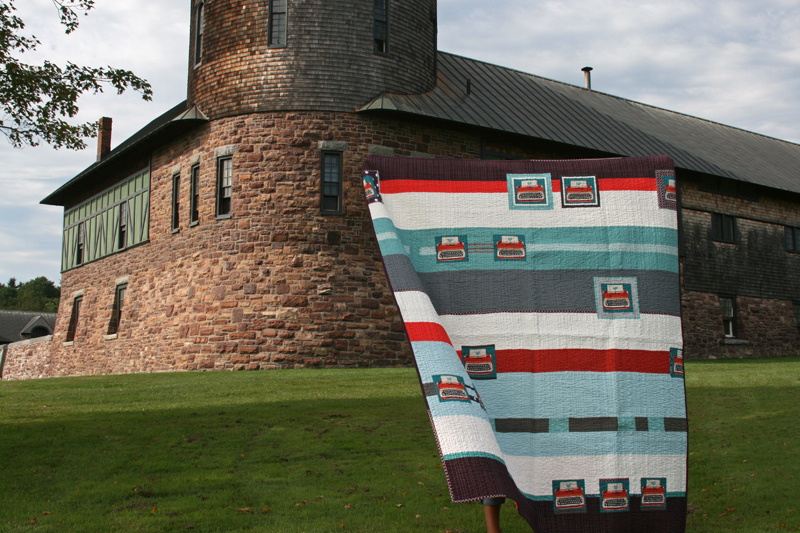 Love your quilt, photography and the local. You could not have picked a better location, the color of the rock, the geraniums, it’s lovely. You’re inspiring me to finish up all those quilts under my bed. I love the straight lines. I always have to get into a radio show or tv series to complete them.